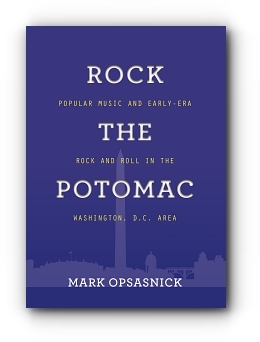 In ROCK THE POTOMAC author Mark Opsasnick provides a comprehensive history of popular music in the Washington, D.C. area from Colonial times to the end of the Vietnam War in 1975, with a strong emphasis on the emergence of rock and roll and its early development in the nation’s capital. Offering a mix of cultural history, extensive night club information and detailed band and musician profiles, ROCK THE POTOMAC stands as a literary monument that will forever serve fans of Washington, D.C. area popular music. MARK OPSASNICK has authored eight books including CAPITOL ROCK and THE LIZARD KING WAS HERE and continues to research and write about various topics in the fields of culture, music and unexplained phenomena. He lives in Prince George’s County, Maryland and frequently ventures into Washington, D.C. where he embarks on long walks, absorbing the sights and sounds of the nation’s capital.